Friendly service. Near city centre. Spacious rooms. 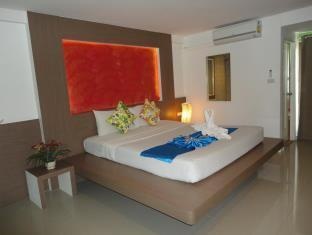 Lamoon Hotel @ Phuket is conveniently located in the popular Phuket Town area. Both business travelers and tourists can enjoy the hotel's facilities and services. Free Wi-Fi in all rooms, 24-hour security, daily housekeeping, grocery deliveries, laundromat are just some of the facilities on offer. All rooms are designed and decorated to make guests feel right at home, and some rooms come with television LCD/plasma screen, internet access – wireless, internet access – wireless (complimentary), air conditioning, wake-up service. Recuperate from a full day of sightseeing in the comfort of your room or take advantage of the hotel's recreational facilities, including massage, garden. Friendly staff, great facilities and close proximity to all that Phuket has to offer are three great reasons you should stay at Lamoon Hotel @ Phuket. Mall close by. Near old town. Good location. Very good hotel. Located near shopping areas and the city center. Friendly helpful staff. Free upgrade. Lovely staff. Expensive buffet breakfast. Good selection for breakfast. Decent breakfast buffet. Upgraded room for no extra cost. Clean sheets. Good sized fridge.